Following is an example of the PHP used to make a connection to a database in Microsoft SQL Server. This is the Server name that displays when making a connection using SQL Server Managment studio. In this screen shot, the Server name is Computer1\\Instance1. In this example, Computer1 is the name of the computer, and Instance1 is the name of the SQL Server instance. 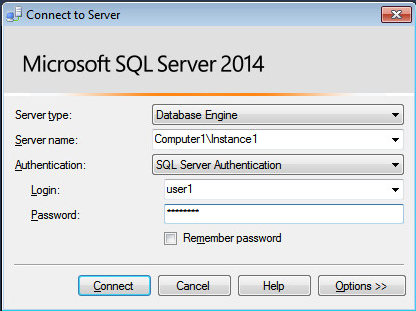 This is the database listed after a successful connection is made using SQL Server Management Studio. This is the Login name that displays when making a connection using SQL Server Managment studio. In this screen shot, the Login is user1. This is the password that displays when making a connection using SQL Server Managment studio. In this screen shot, the password is ******** (when not hidden, the password is "password").